Last night the hamster died. Sorry for breaking the news so bluntly, but it did ... Daughter3 found it all curled up, small and, well, dead in it's sleeping nest. And if it wasn't ACTUALLY dead at the time, it was breathing it's last or expelling distasteful gases, who can tell. Not that it was really OUR hamster at all. The Small Boy found it at in the Spring, cowering between some inappropriately placed plant pots in the summer. "Mum, mum," he said, charging up, dragging me by the hand, "Come and look." And so I looked and you CANNOT leave a defenceless animal in the street when a five-year-old believes he's found a rare and unusual gift. Even if you try really, really hard. We (I) tried to find it's original owner. Invented a mythical small child (possibly in a gingham pinny but definitely with rosy cheeks) who was sobbing over it's loss just in case it was reclaimed but no-one did claim it. After it had eaten it's way out of it's temporary home and started chewing a cable, we threw over £40 at Pets at Home for an excessively excitable cage with inbuilt tubes and wheels and a mezzanine floor. Despite misgivings, it had moved in. The cat - who has for the past 16 years been a fantastic, loyal and very valid reason for never having any other small animal in the house - showed a disappointing acceptance of it's new housemate. A poll (fight) was held on what it should be called and The Small Boy, because he had rescued it, given the final say. 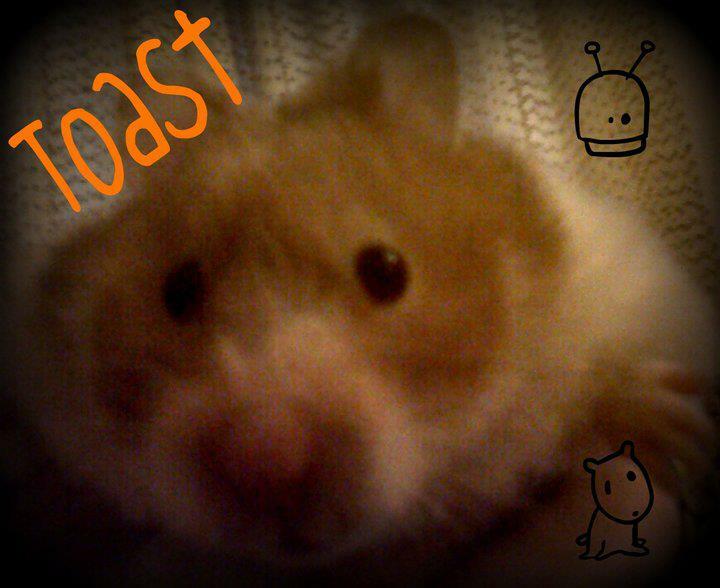 And lo, the hamster was named Toast. It has mostly spent it's time trying to escape, which it did about three times a week, and chewing things, anything and everything. But it was loved, very loved - it and it's cage were regularly cleaned, it's water always topped up and it's food replenished and ALL by the children which, frankly, was astonishing. But now Toast is - I'm sorry - toast. The Small Boy was heartbroken for about three minutes. The ten-year-old, gulping down sobs, put on her brave face and within 45 minutes was asking for a new hamster " .... or a chinchilla." Teen Twin Two was stoically accepting after a bit of a wobbly lip. Unexpectedly, rock 'n' rebel Teen Twin One - 16 years old in about three weeks - is STILL sobbing. We buried Toast, The Man and I, in the garden in a damp and not particularly solemn ceremony. The Small Boy and Daughter Three didn't attend because: "Muuuum, it's raining" and they watched through the window looking a bit sad but a lot drier than we were. Teen Twin Two didn't attend because she was doing her hair. Teen Twin One didn't attend because she was prostrate with grief across her bed. The house is just a tiny bit quieter without constant rustling, the endless, annoying trundling of the wheel and the occasional dull thump of it falling from the monkey bars. And I am NOT googling chinchillas *googles chinchillas*. Arrh, poor old Toast. I have to say the name seems to have foretold his demise. We had a cat called Tarmac...and well you can guess what happened to him! So sweet. Amazing how the kids you expect to be the least affected are the most affected. Did you ever get that chinchilla? !